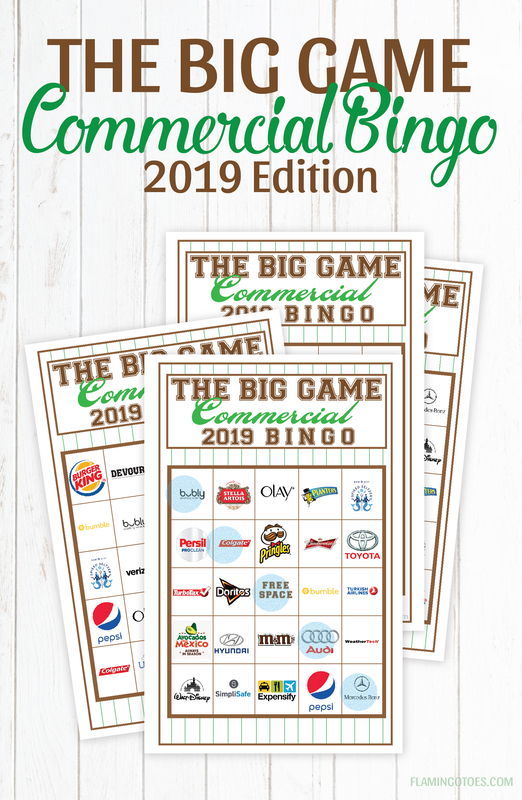 I can’t believe it’s already time for the 2019 Big Game Commercial Bingo! Can you believe we’ve been doing this for five years? I love it! Around here, we’re not so much into the actual game. I know it’s going on, because it’s filling time between commercials and this year. . . Maroon 5. Which is all fine and well, but really, we’re just here for the commercials! Oh. And food. Because . . . guacamole. We like to use Bingo Daubers for these and we print them out on cardstock – just to make sure the ink doesn’t go through. And don’t forget the prizes!! I love hearing stories about people who play this every year – if you’ve played before leave a comment and let us know! If you’re needing some party ideas, check out this post – these Mason Jar Football Mugs are so quick and cute! « New Vintage Keepsakes Needle Minders! Love your blog — the bingo cards are great. We get together with our oldster neighbors (+ 65 yrs) for Souper Bowl. Soup and sandwiches are the menu and we all bring appetizers and desserts. The bingo will add a great new twist to the party. Thanks so much! Oh my word, THANK YOU for updating this every year!!! Our family is big on BINGO and we LOVE LOVE LOVE this! THANK YOU SO MUCH! Thank you for doing this again! We look forward to it every year! We’ve played every year and look forward to another fun game this year. I found a life-size milk chocolate football for the “Blackout” winner! The kids are into the commercial game more than the real game, so we play regular bingo, four corners, and blackout. I always buy Girl Scout cookies for the “Participant Award” prize so everybody wins! Thank you again for this fun family-tradition! Your bingo cards have become a tradition at our Super Bowl party! I usually get ring pops to give out as people get bingos (you know like the ring all the winning players get, haha) and then I do a fun glow stick products or a trophy for the first person to get blackout! thank you again! have been using yours for years and look forward to it each year! i’ve recommended it to all my coworkers!! Thank you so much for updating your bingo cards for 2019! We use them every year! The kids LOVE celebrating the super bowl with their cousins all due to these cards and the movie-theater sized candy prizes we give out for bingos. Thank you so much for putting this together every year! We have played for the last 3 or 4 years and it is one of the highlights of our Super Bowl experience. In our home, we use one card for each half and the first person to get bingo wins $5! Thank you so much for doing these every year. My family loves it. Our neighbors too! Now I have two in college and they still want to play. This would always keep the kiddos entertained even when the Patriots weren’t in the Super Bowl. Being from Massachusetts, we need to be on our toes throughout the whole game…no potty breaks!! GO PATS! !